I was doing my weekly roundup of the junk that had collected since the previous weekend: credit card offers, a "new patient special" coupon for a local dentist's office, two copies of the Uncommon Goods catalog (not junk, that place rules), etc etc blah. Mail just doesn't have the same appeal as it used to. But every month, in the midst of all those dark, dreary bills and statements, I'm gifted with a shiny new issue of Bon Appetit. The only downside to subscribing to a food magazine is that the list of recipes you want to make doubles in length after skimming a single issue. By the time you figure out which ones take precedence, the next issue arrives in your mailbox. I've decided to make a conscious effort to test at least one new recipe from each issue, starting with this insanely good sour cream pound cake. Buttery, dense and waaaay better than that Sara Lee chick's. Nice girl but those double negative jingles had to go. Recipe by The MidAtlantic Restaurant & Tap Room. *I didn't have a vanilla bean on hand so I used the new best and logical substitution: 2 teaspoons of amaretto. In a medium bowl, sift together the dry ingredients: flour, cornstarch, baking powder and salt. In the bowl of an electric mixer, combine sugar, butter and (if using) the seeds of the vanilla bean. Add in the egg, egg white, vanilla and amaretto. Beat for 2 minutes until the mixture has thickened. Add the sour cream and give it another whirl. Add in the flour mixture and beat just until it's combined. Pour the batter into the loaf pan. Spread it out evenly. Bake until it passes the toothpick test. The recipe instructions said to bake the cake for 56-58 minutes but mine took 45 minutes. So keep an eye on that sucker. Let it sit on a rack for 15 minutes then remove from the pan to cool completely. You can whip up a glaze to drizzle over it but I prefer it plain and uncluttered like my mail sorting table. 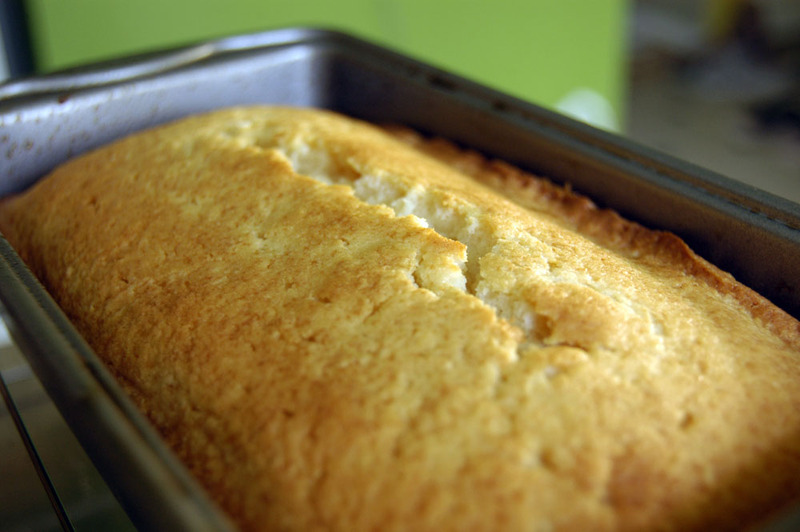 Nobody doesn't like this pound cake. Wait, I mean everybody does like this pound cake. You know what I mean. Ali, I wish I would have had a slice of that pound cake with my coffee this morning. Word. That jingle always bothered me and it took me a while to actually "get" it. Little Debbie FTW specifically Nutty Bars. As for the pound cake, oh baby. I'm eating Famous Amos cookies with SF iced coffee. Yea or nay? I'm with you, Wendi. Oooh, that looks so good. Ali, any leftovers? Wendi - coffee and pound cake sittin' in a tree...but seriously, coffee loves this stuff. Margie - I was a Star Crunch girl myself although I just recently discovered that their name was changed to Cosmic Snacks. Cosmic Snacks? Really Deb? Michele - I'll make another one this week and bring it to Mom's on Saturday. Looks delicious, I can imagine the nice moist flavor you'd get from the sour cream. You'd be proud of me.. I baked not one, but two loaves of bread this week. Beer bread. Green Flash bread, and Lil Sumpin bread. Not sure I could decide which was better but they were both awesome. Liam - forthcoming blog post, please? L'il Sumpin bread sounds delish. I bet it would pair well with...well, yeah. I have the same problem when new magazines arrive! I can't keep up with reading them before the next batch comes in the mail. But it is fun to get something other than bills! Pound cake looks awesome. My great-grandma had a great recipe for one that included sour cream, too. Yum! Ummm, can we say YUM! I LOVE getting a magazine in the mail. It's a happy day when one arrives for me. Your cake looks awesome! Taylor - I've been following your blog lately and I think you've inspired me to subscribe to a fashion mag for the first time in YEARS. Alwayzbakin - when my husband and I were planning our wedding, we would get outrageously giddy when the response cards started rolling in. Your photos are way better than bon appetite! Seriously they are. Wow! I read a billion food blogs but I am bookmarking yours because: I, too like baking and craft beers (try O'so Picnic Ants if you can find it), and because yes, of course, a logical substitution for vanilla bean would be amaretto! Also the cake sounds fab- I'm gonna top it with a lemon juice/powder sugar glaze. Bake on! Drink on! Simultaneously if possible! that looks amazing. and you're right? who doesn't love pound cake? the stuff is dessert, breakfast, snack, everything. and i really need to make that soon. like really soon. The pound cake looks amazing! I am saving this recipe. The pound cake does look really good. I'm going to my hand at making it following your recipe.